Due to the switch in orientation, this model is wider than many A4 multifunction units, with dimensions of 480 x 163 x 290mm. 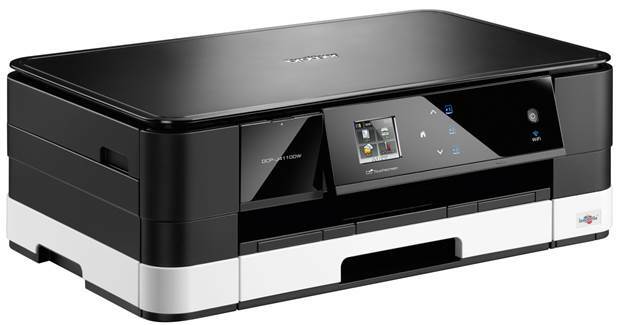 Predominately black in color, apart from the cream colored paper tray supporting the printer/scanner elements, the DCP-J411)DW offers a choice of USB, wired LAN or Wi-Fi connectivity. The front-mounted, 150-sheet capacity paper tray is for A4 and smaller paper sizes. Accessing this paper tray often proved to be difficult and required a certain amount of force to pull it out. Replacing the try was a far easier task. 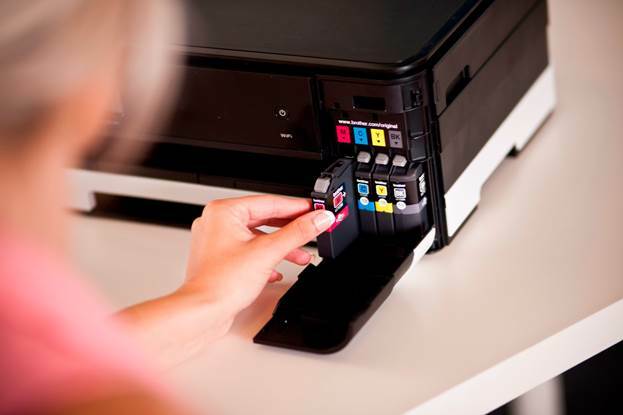 When A3 printing is required you need to feed single sheets into a slot at the rear of the unit, where you will also find the mains power, USB and Ethernet sockets. The front-mounted, 150-sheet capacity paper tray is for A4 and smaller paper sizes. A control panel, adjustable to various angles, is located on the front of the unit. This features a 1.9’ color, touchscreen with various touch sensitive buttons which light up when appropriate. As well as displaying menu options. The screen also provides status feedback and instructions on how to deal with certain things like paper jams and inserting ink cartridges. As usual with Brother, there is an easily accessible compartment on the front of the unit for inserting the four ink cartridges covering black, cyan, magenta and yellow. A second compartment on the front left side of the unit gives access to USB and memory card slots. There is support for SD, SDHC, SDXC, MMC and Memory Stick formats, and images can be displayed on the screen and be selected for printing. Brother’s standard software package contains drivers, utilities plus copies of MFL-Pro Suite and Nuance PaperPort SE12. 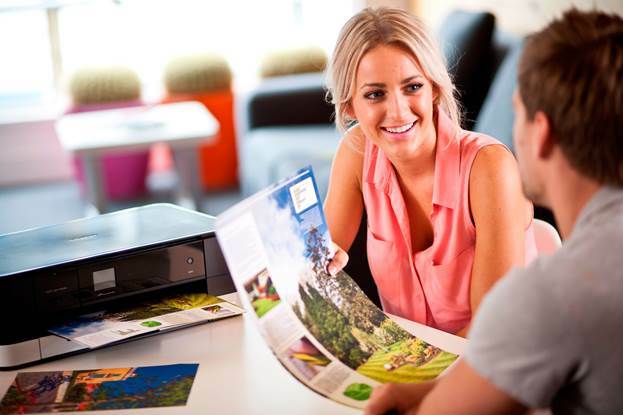 Basic document printing gives you a choice of Fast, Normal of Best quality. Print speeds achieved with my usual 102-word document are listed in the table above. You get reasonable editing quality with Fast and good quality with either Normal or Best modes. There are also options to include manual Duplex, booklet printing or squeezing up to 15 pages on a single sheet of paper. For the record, replacement cartridges, rated at 600 pages, are priced at $36.21 for black and $23.52 for each color. A bundle pack of four cartridges is available for $80.03. 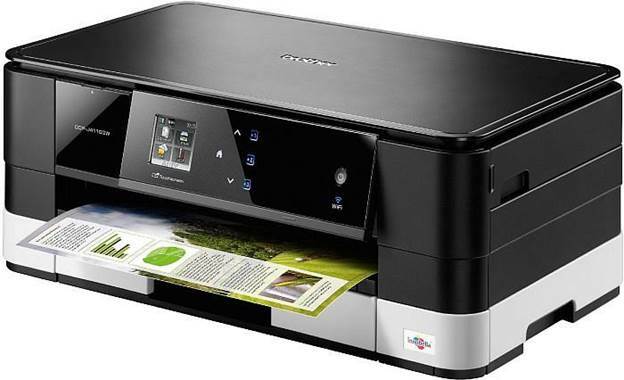 While not up to the standard of a dedicated photo printer, the DCP-J4110DW makes a decent stab at printing your photo images and what it lacks in quality is made up for in speed of delivery, as the second table of timings shows. Considered in terms of value for money, the DCP-J4119DW is rather expensive. For just $30.2 more its bigger sibling (MFC-J4510DW) gives you fax capability, and ADF module and automatic Duplex, making it a better buy. Reasonable output but a little expensive Considered in terms of value for money, the DCP-J4119DW is rather expensive. For just $30.2 more its bigger sibling (MFC-J4510DW) gives you fax capability, and ADF module and automatic Duplex, making it a better buy. · Required Spec: Windows XP or later with 1GB of hard disk space, or PowerPC and later with 650MB of hard disk space.